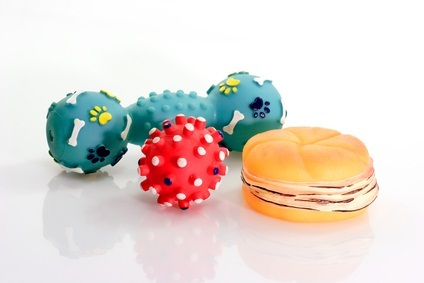 Your poodle needs doggy toys! Keep in mind the size of poodle you have before you buy her toys. A standard's toy won't be the same size as a miniature or toy poodle. 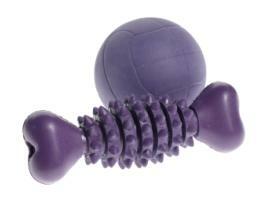 Dog toys come as balls, squeaky toys, soft toys, stuffed toys and chew toys. You can get pet shop toys or toys in your local discount store. A ball for your standard poodle will be too big for your toy and vice versa. It's best to buy a few toys of a different variety and see which ones your pet prefers. Holly loved them all! She loved the squeaky toys, she loved stuffed animals and she loved balloons! She'd hit the balloon with her nose to keep it in the air. It was too cute! If you have a puppy or an adult dog who likes to tear things apart, don't get a stuffed toy, and be cautious with a squeak toy that he can rip open and swallow. And, stuffed toys will cause the stuffing to be scattered all over your house! Your poodle can also swallow the stuffing which could cause health problems. Every pooch should have dog chew toys. Some toys - like a kong dog toy - can be stuffed with his favorite food or treat, kibble or biscuits. These are nice when your pet is alone. Be careful on giving your dog rawhide. Some dogs end up swallowing rawhide which causes his bowels to get impacted from the material. Rawhide bones made from shredded rawhide are a better choice. But make sure you're nearby if you give him rawhide bones to keep an eye on him. 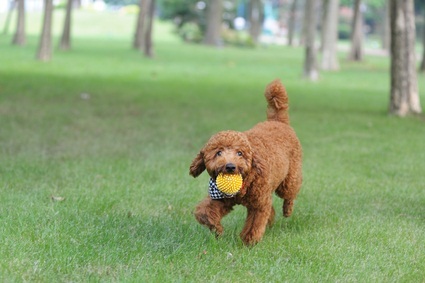 Poodles like to chase and retrieve, it's what their ancestors did! Tennis balls are good for toys and miniatures. You can even play indoors! They'll have fun running after the ball and bringing it back to you for some more rounds. Avoid small balls that your dog could possibly swallow. Frisbees are fun toys for dogs. Make sure there's plenty of room outside for her to run and catch it. It's great exercise for her, too. Keep the frisbee lower to the ground so your poodle doesn't get hurt leaping up into the air to catch it. Poodles love to have fun and love doggy toys. Your pet will probably have a favorite toy or two and might even make up games of her own when she plays with you and her toys.